Infrared thermography is a non-destructive, non-contact technique that uses an infrared detector to map thermal patterns on the surface of an object. They operate on the principle that any object with a temperature above absolute zero emits heat. Thermal imaging units detect this heat and translate it into either a temperature reading or a thermal image of the object. These units are particularly effective because they can detect a range of building issues that are invisible to the eye, including heat loss, water leaks, air leaks, moisture intrusion, and construction defects. 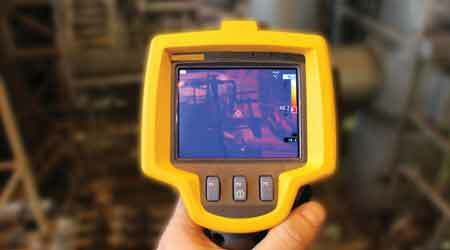 Technicians have used thermal imaging devices for energy audits and energy-efficiency studies for more than 30 years. They also have used them to identify abnormal heat losses through building components, such as walls and roofs, and through gaps around building envelope openings, including windows, doors, pipe penetrations, and HVAC ductwork. Early-generation systems were large, expensive and difficult to use. Today’s systems are compact and simpler to operate. They also can readily transfer data to the facility’s computer system for analysis and storage. Multiple images taken over months or years can help to track the way losses are changing with time. Departments can select from among three types of thermal imaging units: spot radiometers, thermal line scanners, and thermal imaging cameras. Each has its advantages for particular applications. Spot radiometers are the simplest and least expensive units. They show the temperature of a particular spot on the surface of a piece of equipment or a building component. By aiming the unit at a particular spot, technicians can read the surface temperature of that spot on the unit’s meter. Additional spot readings of surrounding areas can show abnormal temperature variations. Most widely used to identify hotspots in mechanical and electrical equipment, spot radiometers also can help identify areas of excessive heat loss from buildings or equipment. Thermal line scanners show the radiant temperature of the surface superimposed over an image of the area being scanned. The resulting temperature variations help identify areas for further investigation. Thermal imaging cameras produce a two-dimensional thermal picture of a surface. The resulting image identifies not only the sources of heat loss but also their relative intensities. When used on building envelopes, units can pinpoint areas with high heat loss. One of the most beneficial uses of a thermal imaging camera is investigating the condition of flat roofs. Areas of moisture penetration, as well as damaged or missing insulation, all show up as higher than normal heat loss. Since the cameras produce an accurate image of the damaged area, managers have the information they need to determine if the roof is a candidate for repair or replacement. Technicians also have used the cameras to document the condition of new roofs prior to acceptance, as well as to identify issues while the roof is still under warranty.